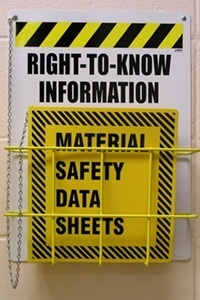 A material safety data sheet is an important part of occupational safety and health in Massachusetts. Employers are required to provide information about the use of toxic and hazardous substances, as well as other safety issues, to their employees. In Massachusetts, private sector employers are governed by the federal Occupational Safety and Health standards. Public employers, however, are covered by the Massachusetts Right to Know Law. If you are injured on the job due to your employer's failure to maintain material safety data sheets, you should consult the experienced Boston workers' compensation lawyers at Pulgini & Norton. The OSHA Hazard Communication Standard applies to private sector employees in Massachusetts. Its counterpart for public sector employees is found in Chapter 111F of the Massachusetts General Laws, known as the Right to Know Law. This state law gives rights to public sector employees regarding their employers' communication of information about toxic, dangerous substances. For example, all workplace containers that have toxic or hazardous substances are supposed to be labeled with clear, weather-resistant labels in English in a prominent place. Similarly, public employers are supposed to keep material safety data sheets in an accessible location for employees. These material safety data sheets are now called safety data sheets in the OSHA Hazard Communication Standard and will start to be called that under state law as well. The safety data sheets factor into the annual training of employees who work with chemical products. New public sector employees are required to receive training from a competent person within 30 days from the date of their hire. The training should include an explanation of their rights and information on how to read a chemical safety data sheet, as well as information about protective equipment, labeling, and any specific dangers related to any chemicals to be used on the job. Generally, if you experience an injury or illness due to a toxic, hazardous substance, you should inform your employer immediately. Your ability to receive benefits is not dependent upon your proving the employer's fault, as it would be in a personal injury lawsuit. For example, if your employer failed to provide you with a material safety data sheet, this would not be a fact that would go toward showing the employer's negligence in a workers' compensation claim, as it would in a personal injury lawsuit. You can only bring a personal injury lawsuit against your employer if it does not carry workers' compensation insurance for its employees. Once you notify your employer of a work-related illness or injury, the employer is supposed to start the claims process. This includes notifying the Department of Industrial Accidents (DIA) and its workers' compensation insurance carrier. You will be given a claim number that you will have to provide to your doctor or health care provider for billing purposes. At Pulgini & Norton, our Boston workers' compensation attorneys can represent you if you suffer injuries due to your employer's failure to provide you with a material safety data sheet. We also advise and represent individuals in Andover, Somerville, Braintree, and other cities in Massachusetts. Call us at 781-843-2200 or contact us via our online form for a free consultation with a knowledgeable workplace rights attorney.